The stage was a blank white canvas and an open book. The audience waited expectantly to greet the colourful animals of Eric Carle's world. The first story, 'The Artist Who Painted a Blue Horse', opened the door for Carle's bold creations to command the stage. I immediately loved the puppeteers' uniform of white overalls, making them visible to broaden the children's understanding of puppets and blending into the background canvas as the animals ruled the stage. Each time the Artist busily painted, silken colour flowed onto the stage. Like a magician, the puppeteers stole our attention with their undulating silk scarves in vibrant hues. In no time the Artist had created a dazzling original creature on his easel. 'How did he do that?' whispered my six year old companion. Each time the music changed we tried to guess what animal the music suggested before they entered the stage. Animals that were playful, sinister, or humorous; all were wonderful, colourful additions that filled the Artist's gallery. 'I am an Artist', declared our clever painter and all the budding artists in the theatre broke their mesmerised silence to clap loudly. Picture yourself with the Very Hungry Caterpillar. Photograph by JA Rossiter. Just as The Very Hungry Caterpillar makes a brilliant early sharing picture book for babies, so too it was lovely to see so many babies and toddlers in the audience. A few rows down from our seats, a whole row of Mums arrived together and sat with babes on laps. Such is the ageless appeal of Eric Carle that the babies provided an excuse for the mothers to attend The Very Hungry Caterpillar Show. 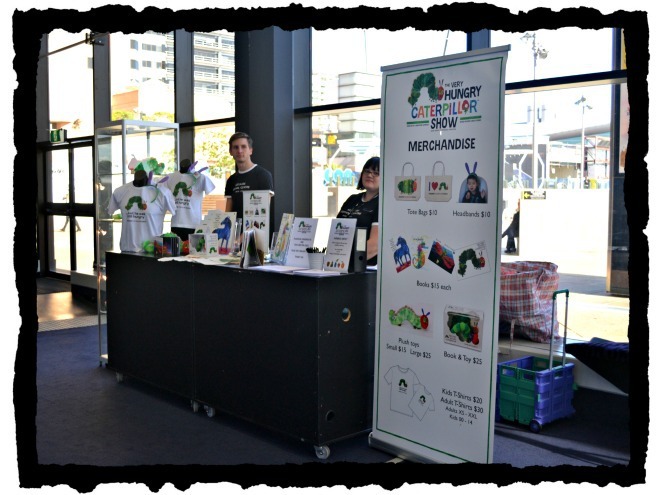 Books, bags, shirts and other items are available at the Merchandise Stall. Photograph by JA Rossiter. Babies are the theme of the next story, Mister Seahorse. Eric Carle cleverly weavers many interesting concepts into his books. Swimming under the sea with Mister Seahorse, we are introduced to many caring and nurturing Dads who are the primary carers of their young. A newly hatched lonely firefly is next to take us on his journey in the dark to seek friendship. We meet many forms of light while looking for his fellow fireflies. The big beautiful moon shines farewell on the fireflies and sheds light on a little egg lying on a leaf. Thus begins the familiar caterpillar story we have hungrily waited for. 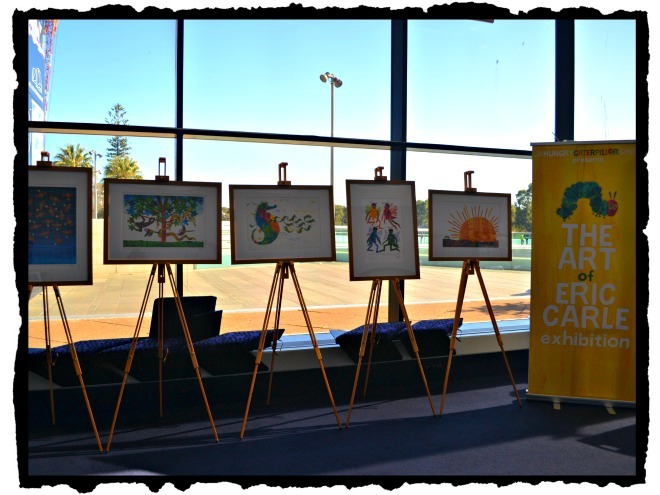 View the vivid colours of original Eric Carle illustrations. Photograph by JA Rossiter. The Very Hungry Caterpillar travels through the days of the week expanding his diet and his size. Soon he isn't a little caterpillar any more. The toddler audience is totally mesmerised. The adult audience feels the sadness of imminent farewell from this magical animal kingdom. The Caterpillar, of course, soars free. 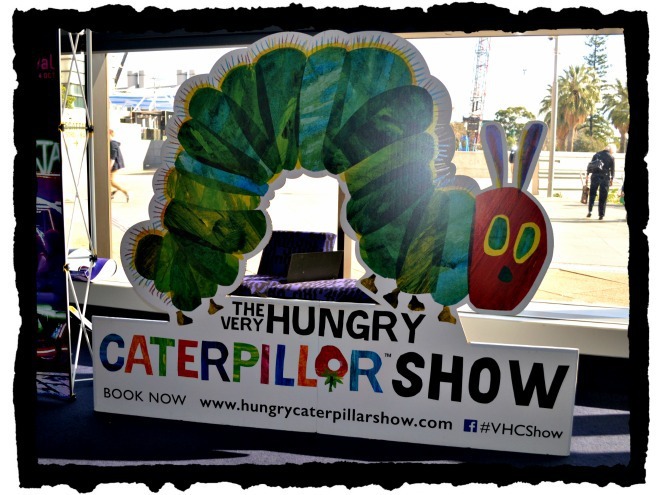 Bring your little caterpillars along to The Very Hungry Caterpillar Show. They will be transformed by the magical storytelling of Eric Carle brought to life by the Puppet Kitchen. Eric Carle says, "I hope the performances will be enjoyed by many and that the colorful characters will bring comfort and joy to all who see the stories that have been so carefully produced. It is uplifting to see such beautiful and cheerful works inspired by my characters!" Tickets are available from ticketcentral or by calling 212.279.4200. Due to popular demand, the Very Hungry Caterpillar Show will extend its run at the 47th Street Theatre through to April 17, 2016, originally closing on March 27. The extension will also include an updated performance schedule with shows on Friday at 10am & 12pm; Saturday at 11am, 2pm & 4pm; Sunday at 10am, 12pm & 3pm.